When it comes to keeping important documents, firearms, and irreplaceable heirlooms secure at home, there’s no better answer than a safe. A safe can make it tough for thieves to run off with your most important items. According to the Bureau of Justice, burglary remains a pervasive problem—in 2011 alone, there were 3.4 million reported burglaries.1 But, this doesn’t mean you have to transform your house into Fort Knox: simply outfit your home with the proper security measures and a safe. Waterproof, fire-resistant, and buoyant, the First Alert 2092F makes its case as a versatile safe. If you live in an area that floods often, the First Alert 2092F might be ideal for you since it can float. And forget about having to buy batteries on a regular basis—the First Alert 2092F is battery-free and has an easy-to-use combination lock for quick access. But we wish the First Alert 2092F were slightly larger to accommodate more items. If you’re a student or move around a lot, you might have better luck with a more lightweight safe. 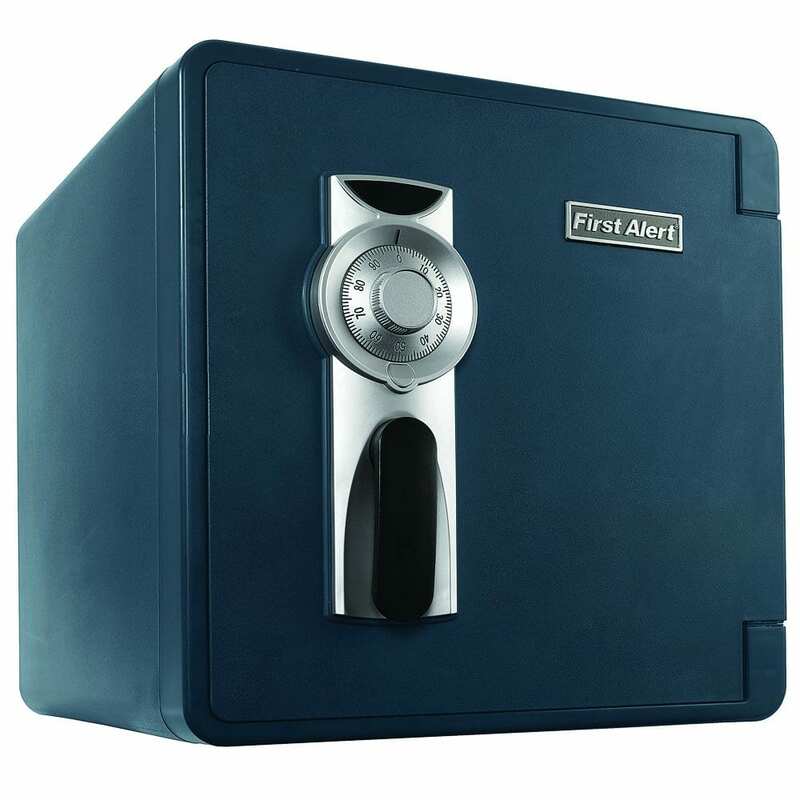 When it comes to fire-resistant safes, this burly yet moderately sized safe provides reliable, tamper-proof protection. 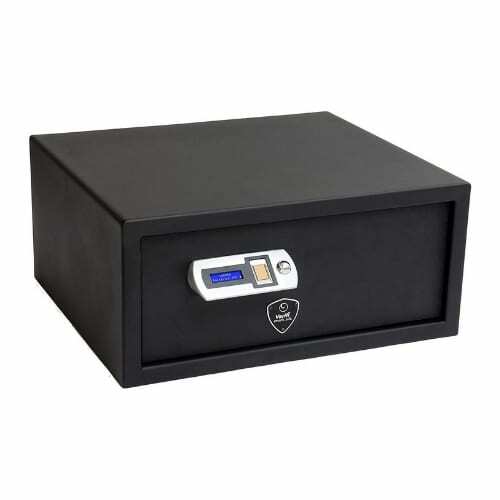 At 185 pounds, the sheer weight of this safe means that it’s mega-tough for thieves to steal. And this safe has been tested to withstand up to 1,850° Fahrenheit for two hours. Plus, its heavy-duty, recessed door is pry-resistant and tamper-proof. 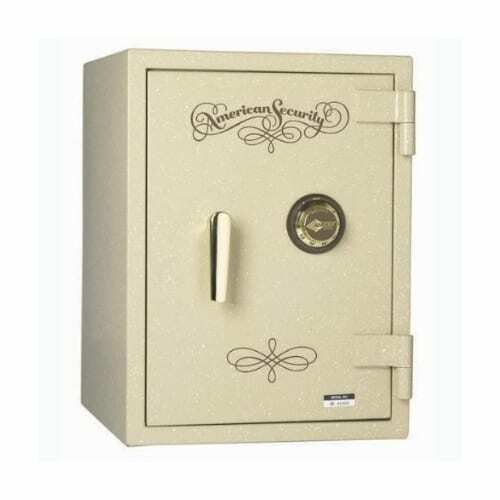 If you’re concerned about crafty burglars, this safe can be anchored to the floor for an added element of security. But despite the safe’s heavy constitution, its measurements are a little on the small side: 18 x 17 x 21.5 inches. This smart safe costs a pretty penny, but knowing that your valuables are safe is priceless. From the low battery alert to the night light, auto lock, and FBI fingerprint technology, the Verifi Smart.Safe. makes its case as a tech-forward safe. If you have curious, young kids, the tamper alerts notify you when Junior gets nosy about what’s in the safe. And thanks to FBI fingerprint technology, the safe provides fast and secure access to valuables or weapons. According to reviews, this safe’s batteries can last up to four years. But it doesn’t offer fire protection. If you need to stash sensitive media, like paper documents, cash, DVDs, or USB drives, we recommend a safe with fire protection. 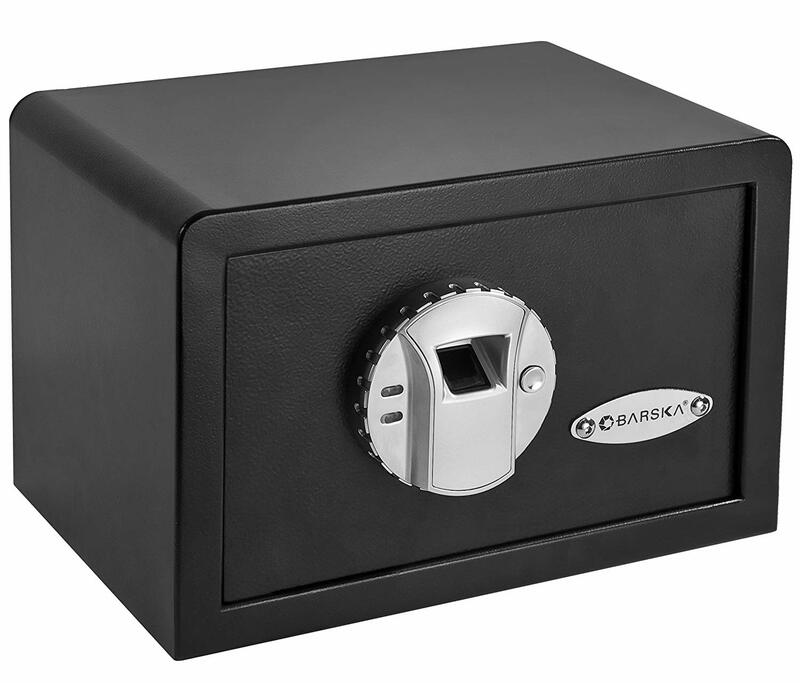 If you’re looking for a knife or handgun safe, the Barska is a great option. The relatively affordable price tag, basic features, and biometric lock make it an ideal safe for smaller weapons, such as knives, pepper spray, or handguns. Small in size, the Barska can be discreetly mounted or stashed out of sight. The convenient mounting bracket provides an added security measure and makes it difficult for thieves to run away with the safe. You can store up to 30 different fingerprints, so you can save the biometric identifiers for all ten toes and ten fingers if you please. The Barska doesn’t have an organizational shelf, which can impact storage arrangement. And while the small size means the safe can be subtly stored, it also means you can’t store much in it. Plus it’s not fire-rated, so sensitive items, such as paper documents or media, could be at-risk. If you do an internet search for “home safe,” you’re going to find a whole mess of options. Some are built specifically for guns, while others offer protection from fire, tampering, or water—and then there’s the lock type to consider while you’re at it. It can be overwhelming, but we’ve got you covered. To start, you’ll need to determine what type of safe is best for you: floor, wall, or bedside. Then assess for the lock type, protection features, size, and budget. Take into account where a safe would be best stored in your house. The type of safe—for a wall, floor, or bedside—will contribute to cost and overall effectiveness. If you have a small floor plan and can make modifications to your home, a wall safe might be a solid option for you. Wall safes can be hidden behind doors or decorations without taking up floor space. If you do opt for a wall safe, make sure that it’s mounted correctly, between studs in the wall. If you can’t or don’t want to make alterations to your home, a floor safe is a great alternative to putting a hole in your wall. These safes can often be bolted to the floor for enhanced defense against thieves, and they come in a variety of shapes and sizes to fit in your closet, spare room, or basement. Bedside safes, such as biometric gun safes, are more secure than simply keeping a weapon in your night stand. These safes ensure that your gun won’t end up in the wrong hands and they open quickly should you need your weapon. The type of locking mechanism and how it’s powered can impact price, access time, and functionality during a power outage. For example, a combination lock won’t open nearly as quickly as a biometric lock, so keep in mind what you’ll be using the safe for. A lock can run on batteries, Wi-Fi, or an AC adapter. Be sure to check for a low battery alert or backup key if you opt for a safe that requires a power source. Regardless of what type of lock you have, a backup key is particularly helpful in the event of a dead battery, no power, or if you lose a set of keys. This is a highly secure lock. It scans and then reads your fingerprint, and it only opens if the print matches one within the fingerprint memory. Thanks to its PIN-based authentication, an electronic key pad keeps your valuables secure yet easy for you to access. A combination lock is as basic as it gets: simply turn the dial to your combination passcode and voilà. And its’ battery-free, so you can always count on it to function. But it does require periodic maintenance. To prevent the lock from seizing, it must be taken apart, cleaned, and lubricated. Your local safe technician or locksmith can tell you more about service costs and specifics. Before you make your purchase, consider what kind of protection you want. Do you want defense against fire, water, or tampering? 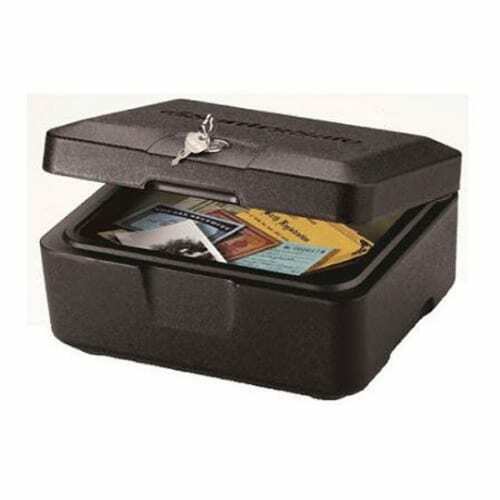 This kind of safe protects the contents from high temperatures or actual fire. Some manufacturers will specify what the safe’s maximum internal temperature is; others will not. If you live in an area that floods frequently, you may want to buy a safe that floats and is water-resistant. Unless specified otherwise, safes are built to withstand a certain amount of tampering, meaning they can endure impact or other kinds of force. The size of your safe will affect where it’s stored, the type of contents it can hold, and the price tag. Tip: be on the lookout for varied forms of measurement—some size measurements will be broken down by inches or cubic footage. While a lightweight safe is likely to be affordable and ideal for renters, it’ll also be easy for a burglar to carry out the door. Consider what kind of items you want to store in the safe. The size of the contents will determine how big or small your safe is. The lock style, size, and type of protection that’s best for your lifestyle will dictate how much money you spend. How to make the most of your new safe and keep it out of the wrong hands. Regardless of what you’re storing in your safe, be it a gun or precious heirlooms, you should keep your safe locked at all times. You never know when you’ll forget to rearm your safe or who will be snooping around the house (e.g., a burglar or nosy kids), so be proactive and keep the safe locked. As tempting as it might be to keep the passcode or backup key in an easy-to-remember spot, you should refrain from doing just that. You never know who could find that extra set of keys or passcode. Fire can destroy valuables in a matter of moments. Some safes are fire-resistant and some are not. Fire ratings are regulated by UL, a company that issues safety certifications, so check if your safe features a UL-approved safety rating. The UL rating specifies the temperature and duration at which a safe will protect your valuables before it finally catches fire. If you do not see a specific UL rating, look for time and maximum temperature the safe is built to sustain integrity during a fire. Take precautions as you would with any expensive product: don’t advertise or compromise the safe’s location. to the floor or secured properly on the wall. Here are some more tools to help round out your home safe setup.